While it is easy to name more than a few Spanish composers, Portuguese composers do not come to mind so quickly. This CD introduces two of them. Some readers might tentatively identify Luís de Freitas Branco as a conductor, but they would be confusing him with his brother Pedro, whose specialty was Ravel and the Spanish repertoire. Here are two individuals that went in different directions – literally – after their birth in Lisbon. After early studies in that city's conservatory (where he learned music theory from Freitas Branco), Fernandes (1906-1983) went, like so many young composers in the years between the two world wars, to Paris, where his teachers included Nadia Boulanger, Paul Dukas, and Igor Stravinsky. Hence, it is not difficult to discern a French influence – at least in this concerto, despite its superficial nods to Portuguese color. On the other hand, Freitas Branco (1890-1955) spent part of his twenties in Berlin, where he studied with Humperdinck. One also can discern a French influence in his music, but by way of Wagnerian disciples. Thus, hints of Franck appear in the symphony, and Bruckner, but also contemporary Russian composers, including Rachmaninoff. Freitas Branco's symphony (1926) is much more interesting. It begins with a theme in the Gregorian style upon which the composer imposes Franckian developments as the movement progresses. Also like Franck, Freitas Branco uses this theme cyclically. His original themes are distinguished, if sometimes reminiscent of Franck and other composers, and he presents and develops them with an appreciation for the value of drama (but not histrionics) and contrast. This is a strongly atmospheric work, and the atmosphere is one of both devotion and doubt. 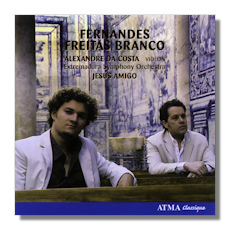 An earlier CD with these same performers (but on the Disques XXI-21 label) presents Freitas Branco's Violin Concerto, and on the basis of what I am hearing here, I am very eager to hear it! The Extremadura Symphony Orchestra only has been in existence since 2000, when it was founded by conductor Jesús Amigo. Sometimes the playing sounds a little cautious, and the sound is not always ideally blended, but this is a more than capable ensemble. The woodwinds make a particularly positive impression. ATMA's engineering is spacious and true. Admirers of tonal music from the past century will enjoy this disc, but probably more for the symphony than for the violin concerto.